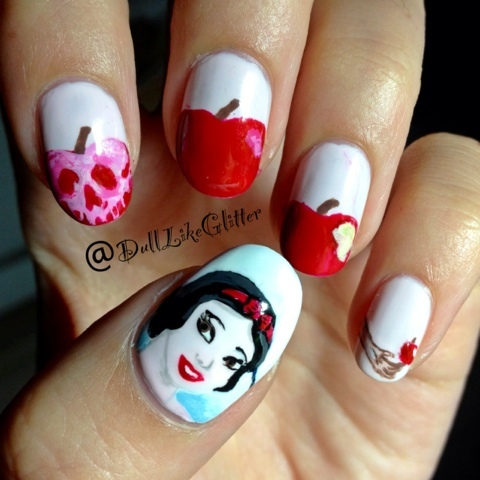 Today I'm sharing some freehand Snow White nail art with you! All the nails you see here were done using polish and small brushes! My base was a pale pink using Nicole by OPIs Studio Mama, this also doubled as Snow Whites signature pale skin. The background on the thumb was Essie's Blanc as well as the whites and teeth of Snow White. Her lips and bow were done using Essie's Really Red and was also used for the apples. The hand and shading on Snow Whites face was done by mixing Essie's Blanc and Essie's Mink Muffs. Mink Muffs was used undiluted for Snows eyes and the apple stems. China Glazes Liquid Leather was used for the outline of the eyes on the face and the hair. It was mixed with a little bit of Blanc to give the hair high lights. Juleps Nessa was mixed with a little bit of Blanc to give the apple its bite. Butter Londons Blagger was mixed with Blanc to get a blue gradient on Whites collar. Finally the poison apple was done using different mixtures of Essie's Really Red and Blanc! Wow!! This is incredible! You're so talented!! This is definitely AMAZING! I wish I was able to free-hand paint like that on a canvas let alone a nail!